If you’re in the market for a new acoustic guitar, Musician’s Friend has a bargain for you, with a hefty discount on the Fender PM-TE Travel. This electro-acoustic has had a whopping $330 axed off the asking price, bringing it down to $369 from $699 - that’s a 47% saving! 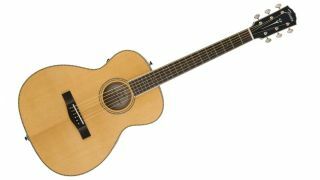 Not only does the PM-TE make a great guitar for players on the move, its short-scale (23.5”) travel body style makes it a comfortable acoustic for beginners, too. It’s also got an impressive sound, owing to a solid Sitka spruce top and solid mahogany back and sides, plus a Fender- and Fishman-designed preamp - there’s even a hardcase thrown in to boot.